For large weddings in and around the city, the Mississauga Convention Centre is a functional and large space that can be excellent for weddings. The best ones that I have been to have used their decor the define the space and to give it grandeur. With large candelabras and table centrepieces with candles decorating the tables it can transform an otherwise generally themed room into a masterpiece. For this wedding a large wedding cake was made to be the focal point of the head table where the bride, groom and wedding party would sit. It was accented with pin lights from the ceiling and large glass candle holders were placed on the table to give vertical dimension to the tables. 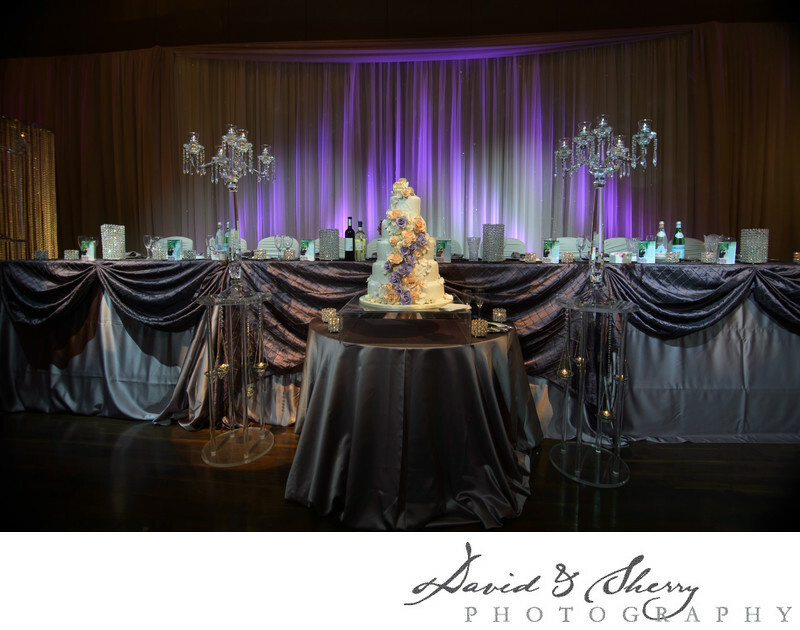 The purple up lights on the backdrop again themed with the design of the cake and the table settings adding a really nice feel to the head table. When taking pictures of the first dance in a space like this we love to pin light our couple with a gridded flash or a steady light so they can be part of the decor they worked so hard to put together.